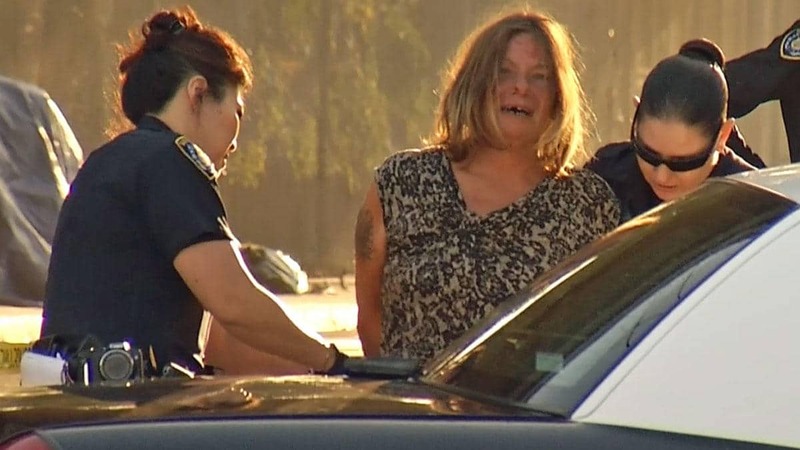 Sandra Mathis, Bloody wife stabs homeless husband to death. Home Scandal and Gossip Sandra Mathis, Bloody wife stabs homeless husband to death. What led to one homeless couple’s self implosion? 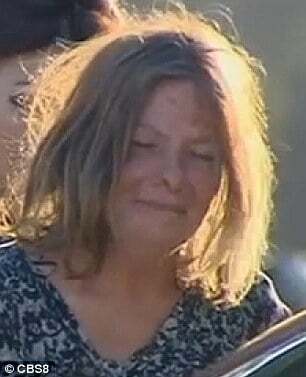 Making media rounds is the bloodied visage of Sandra Mathis, 52, moments after stabbing to death her homeless husband outside of a San Diego homeless camp. Shortly after murdering her husband the woman was caught on tape in disarray and covered in her husband’s blood as she surrendered herself to cops Sunday afternoon just after 4.45pm along the 1800 block of Commercial Street. According to cops the homeless husband’s death came after Sandra Mathis repeatedly plunged a knife into the man’s upper torso. With blood gushing from a wound from the 48 year old man’s neck, paramedics rushed the man to local UCSD Medical center but the husband would die two hours later. Authorities would decline to publicly release the name of the deceased until his next of kin was notified. 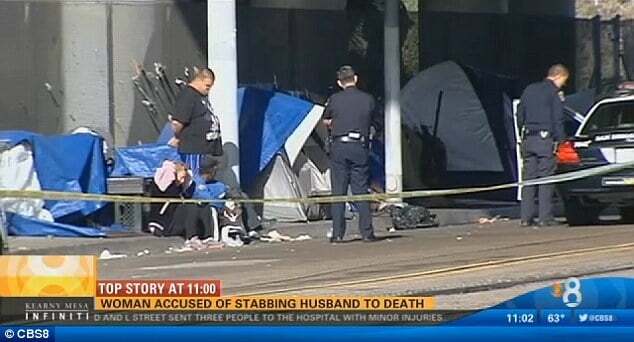 At the time of the incident the couple who had been homeless and were living in a makeshift tent camp under a bridge in the Barrio Logan section had an altercation when the wife resorted to stabbing her husband. What the altercation wasn’t necessarily understood. 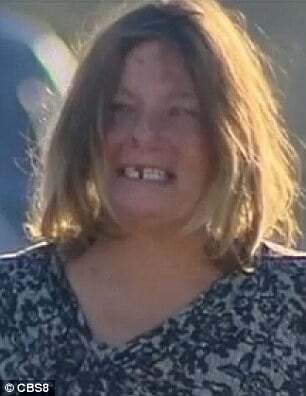 As the woman was rounded up, news cameras arrived capturing images of the disheveled, blood-spattered woman with several missing teeth before being placed in handcuffs. Friends who knew the couple told that the pair had no history of domestic violence and were simply down on their luck, whilst acknowledging that the pair both had a drinking problem. One friend, Carmen Chambers posited that the couple were devoted to each other with things coming to a head because of tenuous living circumstances. Investigators would also seize upon a knife that they believed Mathis had used on her husband. The homeless woman has since been charged with murder and placed in detention at the Los Colinas Detention Facility. The murder comes off the heels of increased violence amongst individuals living in the embittered region at San Diego’s Barrio Logan district.